Make a handsome 17th century castle and its “borgo” your home while befriending a reliable and beautiful horse. Enter Alta Tuscia, one of the less inhabited Italian regions waiting for you to explore its reaches. Your riding days will be spent in the territory surrounding Castle Cristina, a centuries old castle estate still owned by the ancient and noble Caterini family, whose new generation with a passion for horses has turned the premises into an enchanting resort with an equestrian flair. Encased in between Southern Tuscany and Umbria, the land is rich with endless historical and archaeological sites with ancient pasts! This area, cradle of the ancient Etruscan civilization, was later named Ducato di Castro and during the Renaissance belonged to the pope's son, Pierluigi Farnese for over a century between ‘500 and ‘600. View the many tombs, towns, palaces and castles scattered about the countryside while horseback riding along the “Brigands Path” an old track once used by the local outlaws trying to avoid the law, some two hundred years ago! With your faithful equine partner, you will cross beautiful vineyards and olive trees with breathtaking views of Lake Bolsena and ride through lovely chestnut woods and into the open, empty plains. In Alta Tuscia there is an old passion and tradition for the horse and the local cowboys known as the "butteri” regard them as their closest friends. Hospitality is warm and simple, but truly authentic of a region still relying on agriculture as its main income. Whenever possible, every long excursion will stop halfway at one of the delicious resident restaurants or “trattoria” where tasty and bona fide local recipes are served! During your downtime at the castle, lounge in the 2 lovely swimming pools and sunbathe or play a lively game of tennis on the resident courts and even challenge your mate at ping-pong! Mini-soccer and billiards complete the activities available, and if you are lucky, you may even have the Count invite you to share a drink and a personal tour of the tower! 5 riding days: 1 full day (4-5 hrs), 4 half days (2-3 hrs) and one day no riding. Transfers available from Fiumincino or Ciampino airports in Rome, or Orvieto train station between 10:00am to 6:00pm. Rates do not include: Insurance coverage (mandatory - can be purchased via Hidden Trails or locallly (in advance), daily maid service. Sample Itinerary / Activities - Subject to changes. Day 1: Afternoon check in, welcome drink & briefing with guide\instructor about riding and accommodation details and choice of the horses for the days ahead, enjoy your first dinner. Day 2 to Day 7: You will be participating in the following rides/trails, shown below in no particular order here. Day 8: Departure after breakfast, say your good byes! Transfer to Orvieto train station or Rome Airport (transfers at extra cost) or depart by rental car! This is a full-day excursion. From the castle we ride through the neighboring farmland, through chestnut woods on an ancient track which will carry us right above the crater of Lake Bolsena, the largest volcanic lake in Europe. While riding, we will witness some breath–taking views of the lake and surrounding area and of the two islands, Isola Bisentina and Martana. As we head down to the lake, you will note many Etruscan tombs scattered throughout the countryside some re-used by farmers as cellars for their wine but still serving as a reminder of the ancient history which abounds in this area. Once at the lake, lunch is served in a typical trattoria, right on the beach. In the right season if you wish to cool off in the water, a swim in the lake can be done before starting the ride back up. We pass the archeological area of Pianezze, literally full of Etruscan tombs dating back 2600 years. Once at the top of the crater, we turn through some vineyards until we reach the shepherds' trail in the woods to the Santa Cristina Castle estate. This is an incredible ride through Lazio and Tuscany that is not to be missed. Travel on horseback from the Santa Cristina Castle estate to the fortress of Proceno, very much the same way as the dukes traveled hundreds of years ago. From Santa Cristina, we ride towards the medieval town of Onano. The 16th century church of ‘Madonna delle Grazie’ is half way along the trail and from there we have a charming view of the village walls. We then carry on north towards the magical landscape between Lazio and Tuscany. As we cross the Montorio Game Reserve, we may be lucky enough to see the wild pheasants, fallow deer and wild pigs. Before crossing into Tuscan territory, we wade through a ford in the Stridolone River, before carrying up onto a hilltop which looks over the fortress of Proceno itself. Proceno is a village dominated by the fortress, dating back to medieval times - approximately year 1000. After lunching on delicious Italian cuisine, we cross the river again and climb up onto a plateau, through thick vegetation, using an old farmers’ trail. As we head home, we ride past vineyards, fields and finally a former nuns’ convent from the 18th century, with a sad past to learn about. Finally, we return to the castle from the Northeast after 40 km of beautiful riding. This is one of our most renowned excursions. Lake Mezzano is an area worthy of note, owing to its great historical value and natural beauty. The lake itself was once a volcanic crater, formed 400,000 years ago, and the site of human settlements dating right back to the pre–Etruscan era (around 2,700 years ago). Because of later earthquakes, these settlements are now submerged under water, but the importance of these archeological treasures was confirmed in the mid-eighties by an archaeological campaign when swords, pots, and other tools were found on the bottom of the lake. Our excursion takes our riders through the farmland, up into the wooded hills which surround Onano. Here, the horses have the opportunity to canter along a wonderful natural passage surrounded by trees. At the top of this plateau, we have a chance to take in the dazzling scenery, before we carry on down past the local farms into a very old woods made of huge chestnut trees that leads us into a flat and open plain which offers a great deal of scenery. Here, if desired, horses can canter up the old tracks, before we reach the marshlands and vineyards which surround the Lake Mezzano itself. The Lake area is part of the Selva del Lamone natural reserve and here is a small restaurant where we stop for lunch with a fantastic view overlooking the water. During the warmer months, anyone who wishes can also swim in the lake's crystal clear waters. In the afternoon, we ride back following the old Brigands Trail, taking in a few historical sights on the way. Once we leave the castle following the old track, we will reach the hills framing our plateau to the west. Through the chestnut woods we arrive at the top where we have a breathtaking view of the area, from the beautiful crater of Lake Bolsena on the Southern side over to the hills surrounding little Lake Mezzano on the Northern side. On a clear, breezy day the sea can be seen 40 km away to the West like a glowing mirror reflecting in the sun. We shall ride up through the valleys and hills and onto another plateau to take in the spectacular scenery, including the towering Mount Amiata, the Radicofani Fortress and the distant castle of Torre Alfina. From the hill again we will follow a large track winding through the fields taking us back to the castle. On this mini trek we will easily reach the hills framing the plateau in the west on whcih the castle is situated. A fantastic spot for a breathtaking bird's eye view from the beautiful crater of Bolsena Lake on one side to the surrounding hills of Lake Mezzano on the other side. On a clear day the sea can be seen 40 km's away like a glowing mirror. We tackle an ancient track carved into the rocks, until we reach the famous “Brigands’ Path”. Passing the old farmhouse of St. Prospero, at a brisk trot we turn left on the path, crossing cultivated fields and later the chestnut woods. We can now push horses into a canter through a fantastic natural passageway in the woods, leading riders through an exhilarating run in a fairytale environment. Soon we will find another old road carved into the rock, leading us down to the ancient church of St Maria delle Colonne and its nearby fountain. From here, we return to the castle exploring the beautiful Italian countryside and endless chestnut woods. We use the old outlaws’ track called the Brigands’ Path because it leads us on to a ride down a panoramic old trail among pastures of grazing sheep and after a couple of km it turns down into a narrow valley of volcanic rock. At the bottom of the hills we will find an old abandoned settlement, Nocchieto, still fascinating in its architecture, it is an ancient house made of local tufo rock, leaning against the side of the hill. As the road changes from volcanic rock into soft ground, we can push gently our horses forward into a canter and up into the hills. After following a narrow valley we are once again meet the Brigands’ Path, where we can carry on across varied landscapes and scattered Etruscan tombs and caves. Finally, we make our way back to the castle, to another stunning plateau, where we encounter a lovely vista, before returning home through the woods. After leaving Santa Cristina, we pass an old farm named St. Prospero and we ride up through the valleys and hills, through romantic chestnut woods and up onto the plateau to take in the spectacular scenery, including Mount Amiata, the Radicofani Fortress and the distant castle of Torre Alfina. We then arrive at the S. Luigi farm, where local shepherds still produce delicious ‘ricotta’ cheese. Around us sheep graze happily in the fields as we follow the way home back along the hills to the castle. This time we head north through the hills, a spectacular scenery of the castle estate and surrounding farmland will keep us company. After crossing the provincial road, the trail will lead us towards a magical scenery made by the Tuscan mountains towering in front of us. The trail carries on around the vicinity of Onano – a fortified town of the Middle Ages. Your guide will show you the medieval castle dominating the ancient town – an important stronghold of the Monaldeschi family which ruled the area in the Middle Ages. We keep on going along the old farmers’ tracks, up into the open fields, past the delightful medieval church of St Maria delle Grazie and then back home to the castle. Following an old Etruscan trail, we ride up through thick woods to the top of the crater surrounding Lake Bolsena. Here, we enjoy a remarkable scenery including vineyards, Etruscan tombs, the prominent volcanic lake and the panorama dominated by the famous Farnese Palace in Gradoli. A gift of the Pope in 1500 to his nephew for his wedding - what a present! We return to the castle riding through the vineyards, vegetable gardens and enchanting woods. In particular, we enjoy a canter through a unique tunnel made by the oak trees above an old shepherds path. 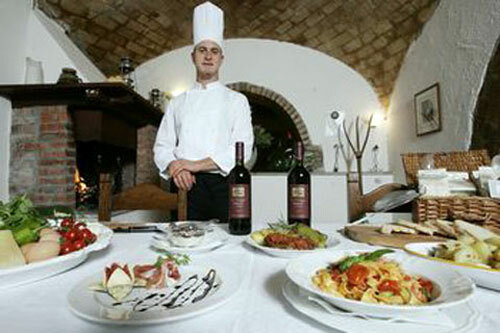 Cooking classes are taught by chef Giovanni Verzini, a chef of great international experience. Giovanni will give you a real hands-on lesson where you will learn the basics of Italian cooking and the techniques to make an impressive four courses meal, from home-made pasta to traditional desserts and everything in between. All of the ingredients you will use are bought each morning from local farms and markets. If you wish you will be able to participate in the purchase of the necessary local produce for the lesson of the day. The classes can be from half a day to a week. It is up to you to decide A half a day class including dinner prepared under the supervision of the chef will cost you € 100 per person . Every class can be a maximum of 5 people. There is no minimum required. Pace: Beginners to expert (gallop, jump). Moderate with trots and canters. Riders must be capable of posting trot and 2 point seat while cantering. -Helmets are mandatory at this establishment! Riding boots or shoes with flat soles that cover the ankles. Just below the castle stands a handsome 18th Century farmhouse, the original centre of the estate’s farming activities. The farmhouse has been skillfully converted with careful attention to conserving authenticity together with comfort and privacy, in a pleasant combination with communal living. The large farm now contains eight charming apartments and 14 bedrooms furnished with original pieces. The ground floor of the farm house opens onto the main terrace, which overlooks the swimming pool. On the ground floor there is a large “taverna” with brick vaulted ceilings. The space is divided into three main areas: dining room, billiard room, ping-pong room, plus a large kitchen available for all the guests and equipped for cooking courses. We also offer a washer and dryer. Volleyball courts, mini football pitch, and Jacuzzi on site. Dinners will be served either in local restaurants or at the castle estate. Since the time of the Etruscans and the Romans, natural hot springs were considered a natural source of wellness with therapeutic properties. Given it’s volcanic soil, Southern Tuscany offers a vast range of thermal baths of different levels.Only 18 km away from the castle, next to the village of Sorano there is a well organized spa facility. There you can to swim in the warm waters and relax beneath two beautiful waterfalls. Here, you can enjoy a natural hydro massage, a special massage or various spa treatments in the wellness center. Waters are flowing from natural springs at 37° centigrade. The area around the swimming pool is largely equipped with sun beds and umbrellas to satisfy the needs of everyone.A small river surrounds the spa and receives the outgoing native waters. It’s mixed waters come from a little stream in the woods and several other hot springs.